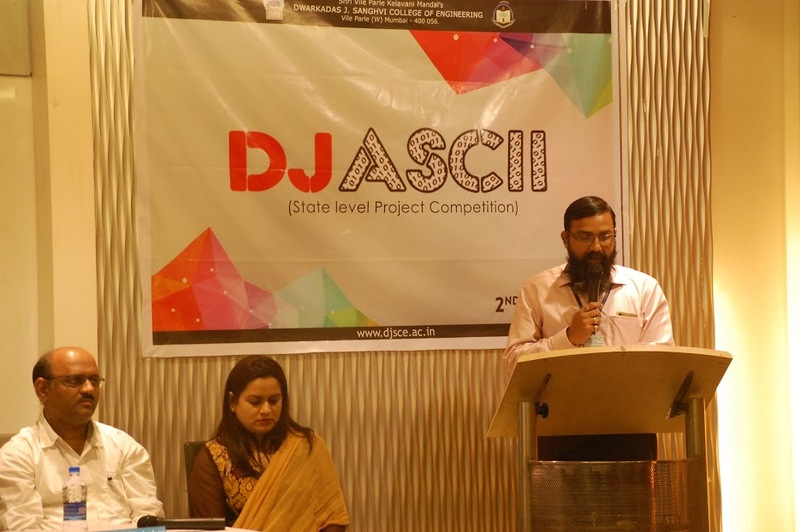 With the tremendous support of the faculties from the departments of Computer Engineering and Information Technology of the college, DJ-CSI co-hosted the 2nd edition of DJ ASCII – a state level project competition along with DJ-ACM student chapter on 1st April, 2017.There was a massive participation of the students from the college as well outhouse colleges. Various projects from different domains such as Artificial Intelligence, Augmented Reality, Data Mining, NLP, etc were presented to the alumni of our college. A team of five experts from the field of IT graced DJ-ASCII with their presence to judge the best projects of the competition and were overwhelmed by the efforts put in by each participant to engineer their exuberating products. This splendid event concluded with the valedictory function disclosing the results of the project presentation as well as the poster presentation. This introductory workshop on “Databases using SQL” was taught by Zaid Merchant, the chairperson of DJ-CSI. Starting with basics of data definition language (DDL) and data manipulation language (DML), the attendees of this workshop learnt how to create a database, insert data in the tables and also learnt how to update and alter a table contained in a database. The students acknowledged the efforts of the instructor to provide a good knowledge base of SQL keeping in mind the time constraints for the workshop. CSI week continued with the immensely popular “Photoshop” workshop which was conducted on 9 th March, 2017. Taught by Dishith Poojary, the co-technical head (creative) of DJ-CSI, participants were shown how to create fabulous looking images using basic editing tools in Photoshop. The attendees were surprised to know that they could also make small scale animations using Photoshop! The third workshop for CSI WEEK was the “Python” workshop. Conducted over a period of two days, the primary aim of this workshop was to introduce Python, a high-level object-oriented programming language, among students and also teach the basics of data structures using python. 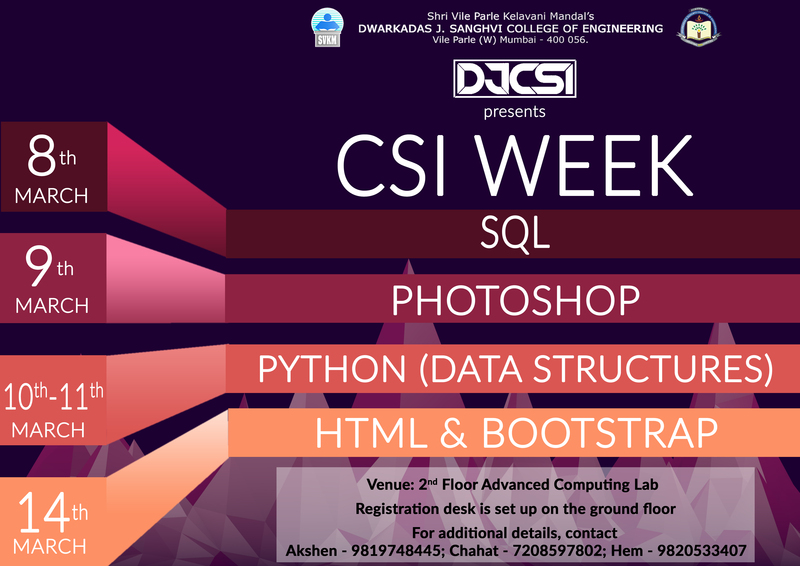 On 10 th March, 2017, the first segment of this workshop was taught by Siddhant Gada, the co-technical head (events) of DJ-CSI . He introduced the language of Python to the students who were taught how to write simplescripts in Python so that they could familiarize themselves with the syntax and structure of this language. The next day, i.e., on 11 th March, 2017, the second part of this workshop was taught by Monik Pamecha, a fourth year student of our college belonging to the department of Computer Science Engineering. He introduced the topic of data structures to the attendees after teaching the concepts of objects and classes in Python. After many house-full workshops, it was finally time for our last event of CSI WEEK,the “Web development using Bootstrap” workshop, which aimed to lay thefoundation for web development for the student attendees. The workshop introduced the concepts of HTML, CSS and Bootstrap and took place on 14 th March,2017. The lead speaker and instructor for the event was Akshen Kadakia, the vice-chairperson (technical) of DJ-CSI. The workshop started with a basic explanation of HTML and a description of its features. The students followed Akshen as he tookthem through the basics of HTML including the header, para and div tags among others. Next, the workshop moved towards styling with Cascading Style Sheets or CSS. Firstly, Akshen explained styling within the HTML tags and then proceeded to separate out the CSS rules into their own CSS file. Lastly, Bootstrap was introduced to the students and a pre-built example is used to explain how Bootstrap themes can be quickly edited and modified for personal use instead of creating a web page from scratch. This third edition of Codeshastra was unlike its previous two editions. 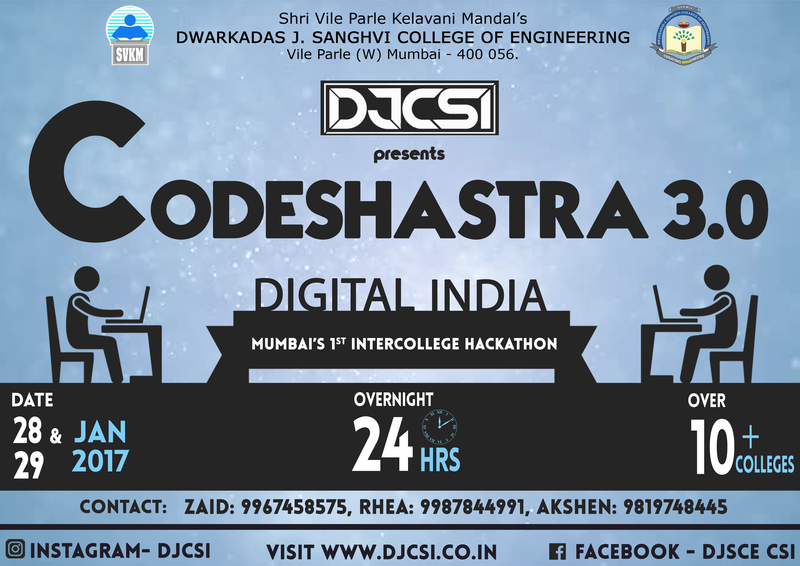 Being an inter-college 24-hour overnight event this year, Codeshastra 3.0 was divided into two rounds – Round 0 (intra-college) and the Main Round (inter-college). Round 0 of Codeshastra 3.0 took place from 7am to 7pm on January 22, 2017. 197 participants were present for this event. They consisted of students belonging the second, third and fourth year from the departments of Information Technology, Computer Engineering and Electronics and Telecommunication. Codeshastra 3.0 was held for 24 hours consecutively from 4pm on 28th January to 4pm on 29th January,2017 thus making it one of SVKM’s first overnight hackathons. It was held in association with CSI Mumbai. The event thus ended on a high note with all participants acknowledging the efforts put in by the DJ-CSI committee and the staff to pull off such a big event without a hitch. This event, which saw a massive participation of over 340 students, was truly a memorable one and will be etched in our minds for years to come. 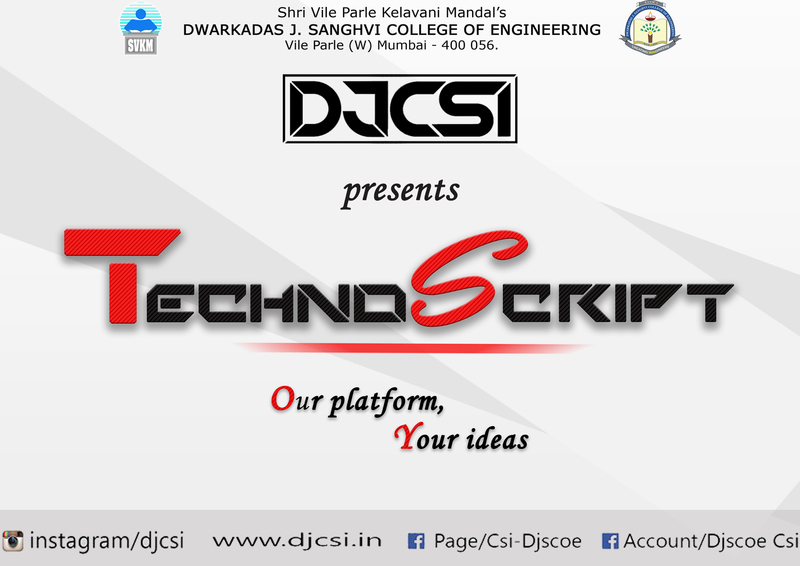 Taking student participation to the next level, DJ CSI organized TechnoScript, a competition open to all students irrespective of year and branch. All participants wererequired to send in their articles on any technical theme of their choice and the best article would be featured in 'Protocol', the annual magazine of DJ CSI.